After our day off in Helen it was a bit of a shock to the system to be hiking again. This day was the windiest and coldest yet. We ended up hiking farther than we’d planned in order to get to a lower elevation out of the wind. It was once we got to camp that my day got interesting. As evening drew in I started to try to hang my bear bag. My bear bag is just a dry sack in which I put all my food, toiletries, and rubbish (anything with an odor) every night and hang it from a tree in order to a) not attract bears to my tent and b) hopefully not allow bears to get my food. While simple in concept the hanging of a bear bag is actually a skill that requires some refining. The hardest part is finding a tree! It sounds stupid as I’m camping in a forest, but it’s actually very difficult to find a tree with a suitable branch as it needs to allow the bag to hang six feet from the trunk, six feet from the branch and 12 feet from the ground. I’d been eyeing up a particularly good branch but was gutted when someone else was already attempting their hang there. I started throwing my line (I had a small rock in a bag clipped onto my cord, which is what I was throwing in order to get the line over the branch) over every vaguely promising looking branch. Half an hour later I was still failing to throw my line over slightly dodgy-looking branches and getting my line tangled up on all the surrounding branches! Eventually I had to stop because I managed to clip the carabiner that was attaching my rock sack to my rope around a side branch of the tree. I heard the sound of the carabiner clipping and knew it was all downhill from there. Jerry and Slouch tried to rescue my line by pulling so hard on it that the branch would snap but ended up snapping the cord instead. My rock sack, carabiner, and snapped cord are still clipped to that tree. In the end I went to the initial tree I’d been eyeing up and hung my bag on a borrowed line with only a couple of false attempts. Once I’d finally got my bag hung it was time to warm up by the fire. My feet were cold so I was sitting with my feet propped up on the edge of the fire pit. Several people warned me to be careful so as not to set my Crocs on fire. 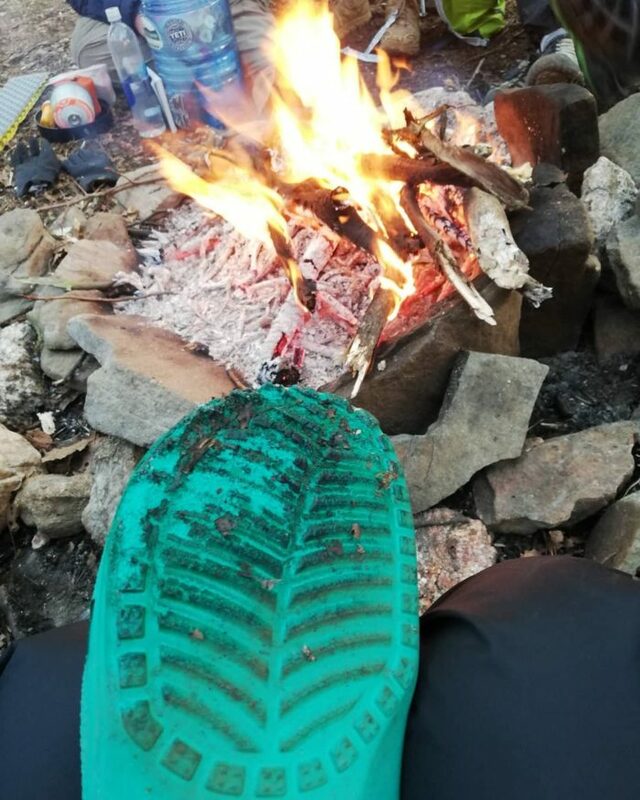 My response to this was, “At least my feet would be warm.” Five minutes later my Croc was on fire. Thankfully it didn’t burn all the way through! I almost earnws myself a new trail name: Hot Foot. A couple of days later was our first big milestone: the Georgia/North Carolina border. This meant that we’d completed one out of the 14 states on the AT. Although this was a milestone I was looking forward to this day was not one of my favorites. A succession of bad nights sleep had left me tired and lacking in energy. I hiked solo as I wasn’t feeling very sociable but wanted to wait for some of the boys when I got to the border. Shortly before the border my knee, which had been sore before I started the trail, started playing up again and I found myself almost limping up the steep hills. I signed the hiker log at the border with the words “First bad day on trail but so happy to be here,” which pretty much summed up my day. My happiness at being in North Carolina quickly evaporated as I was greeted by what felt like the steepest climb of the day so far. My knee did not enjoy this. I’d never been so happy to arrive at camp and almost fell asleep twice while setting up my tent. These were two of my favorite days so far. I hiked with Slouch and Q-Tip for both these days and we all agreed to take it slow and take lots of breaks due to a few niggling injuries. The weather was great and there were many spectacular views. On day 13 we passed the 100-mile marker. 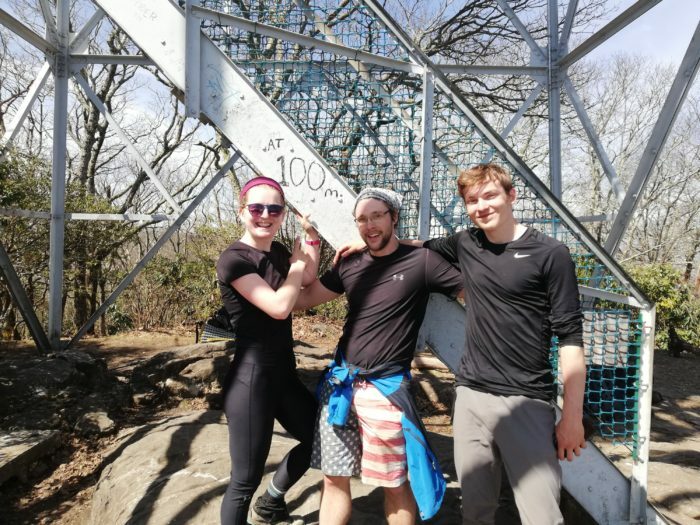 The 100-mile marker sits on top of Albert Mountain, one of the highest peaks so far. The climb up was very steep but surprisingly fun as it involved a bit of scrambling up rocks, which was a nice change from all this walking. On the top we were rewarded with the fire tower, a metal structure with stairs leading up to a small room and viewing platform with 360 degree views of spectacular mountains. It was pretty windy and the steps were a bit wobbly but the views from the top were well worth the climb. We’d initially planned to hike four miles to the next road crossing but discovered that there was actually a shuttle to Franklin that picked people up directly from our campsite. We decided to take advantage of this and had our first full day off hiking. Somehow we still ended up walking several miles around town but these miles were mainly between the hotel, an all-you-can-eat buffet, and Lazy Hiker Brewing, so I can’t complain too much. Franklin was our first town in North Carolina. All the locals immediately recognized us as hikers and about five different individuals invited us to a free pancakes and bacon breakfast at the Baptist church the following morning. Although it was an early start I was incredibly glad we went to this breakfast. Not only was it my first taste of proper American pancakes (would recommend!) but it was another example of the incredible kindness shown by the communities surrounding this trail. After breakfast I went back to bed while the boys trekked to the post office to pick up some parcels. After this it was time to head back to the trail. 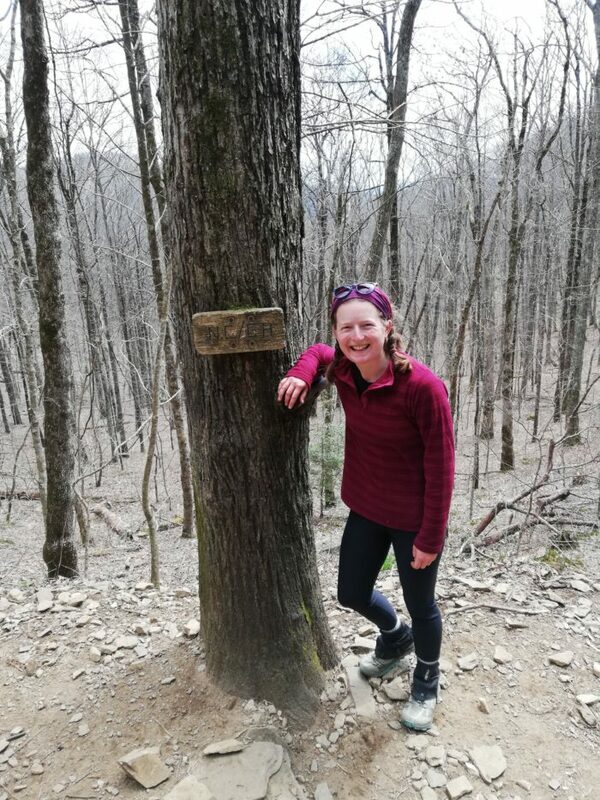 I was feeling pretty tired and didn’t want to leave the comfort of the hotel room but after five minutes of being back on the trail I was happy to be there. Four miles in we received some more trail magic; a 2018 thru-hiker and his family had set up a barbecue at the side of the road and offered us hot dogs, cold drinks, and many snacks. 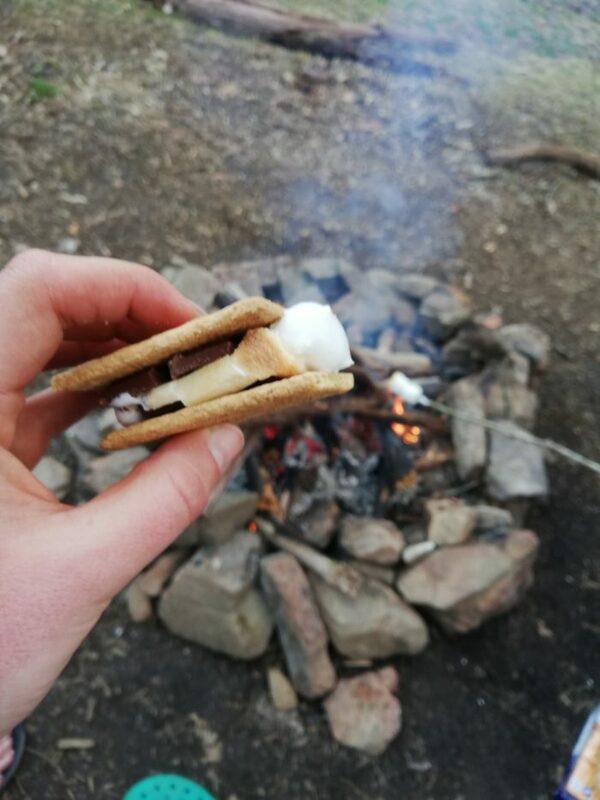 Once at camp the food overload continued as Slouch had packed out the ingredients to make s’mores. Again, this week has been incredible and there are literally too many interesting people and experiences to include them all here. We’ve been incredibly fortunate with the weather and today (day 16) is the first time I’ve had to pack up a wet tent and walk in the rain but even this rain only last about 15 minutes. I am, however, currently lying in my tent listening to a torrential downpour and hoping that the big flashes of lightening don’t come anywhere near my tent while I sleep. I think it might be a long night. Enjoyed reading about your bear bag saga! Try using a 20 oz Gatorade bottle with a little water in it….just loop the line around the bottle neck….easy to throw…never tangles…also eliminates need to find just the right sized rock, which can sometimes be as difficult as finding the right tree!